As sad as it may be for those losing their cars to repossession due to non-payment, the other side of this is that many cheap vehicles can be purchased from the major banks such as FNB, ABSA, Standard Bank and Nedbank. Companies such as Burchmores hold frequent events on behalf of the banks to sell off these vehicles in an attempt to recover funds lost. Many second hand dealers take advantage of these events and can often be seen bidding on whole fleets of vehicles. So what is a repossessed vehicle? When an individual purchases a vehicle, they usually apply for financing through a financial service provider. If something should go wrong with their finances and they find themselves unable to pay their loan repayments, the financial service provider may repossess their vehicle. Financial service providers are obliged to repossess vehicles in these situations to make up the money that they may have lost due to the individual’s non-payment. The financial service provider usually sells the vehicle through a bidding process at an auto auction. Because they are so eager to move the vehicle as quickly as possible, they often drop their prices very low. Some financial service providers auction off their own repossessed vehicles while others pass them on to auctioneering houses to get rid of them. Why is it a good idea to purchase a repossessed vehicle over a brand new or second hand vehicle? The financial service provider, individual or company selling the vehicle is usually trying to get rid of it very fast and so the sale will go through quickly. The service plan and warrantee may still be intact saving the new owner money on maintenance and repairs. 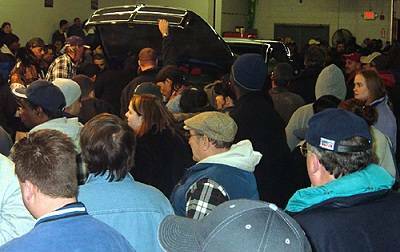 Going through an auction means that the potential buyers decide what they are willing to pay for a vehicle. The following are some of the reasons why it may not be such a good idea to buy a repossessed vehicle. When you purchase a repossessed vehicle, you are buying it ‘as is’ which means that if you find any faults, flaws or damage, you will have to pay for the repair or maintenance yourself. Knowing exactly how to buy repossessed cars at one of the South Africa auctions is easy. Lists and catalogues are available of everything that is due to be auctioned off on the day and most of them allow potential buyers to view from a showroom or warehouse floor the day before. We advise you take someone with some mechanical knowledge if you are going to go and view at the warehouse or the showroom on the day before, or at least someone who knows what things to look out for when buying a second hand car. Very often the fact that the previous driver was struggling financially means that maintenance, regular services and repairs may well have been neglected. Which of the above is quickest, best option? The quickest, most hassle-free option out of the above six is definitely to shop online for a repossessed vehicle. You will be able to search for and find out about vehicles in your own time at any time of day or night without leaving your home. You can bid on vehicles away from the stress and hustle and bustle of busy auctions and take your time, without any pressure, to make your decision. However, you must make sure that you inspect the repossessed vehicle in person before you decide to buy it to avoid disappointment. It is important to keep the following in mind when you look for repossessed vehicles to buy. Make sure you conduct a thorough inspection of the vehicle before you sign anything or purchase it. Take an expert with you if you do not know too much about motors or the inner workings of a vehicle. Ask for the VIN number to ensure that the vehicle is not stolen property. Make sure you do not go over your budget. Find out how the auction process works so that you do not make a mistake and end up bidding for a vehicle that you don’t want to buy. Accident damage is something very important to look out for as well. Make sure you inspect the vehicle from a few metres away and at several different angles looking for doors or any of the bodywork panels that may be out of alignment. Check that the colour of the vehicle is consistent all over and check for any “over-spray” especially around the engine areas under the bonnet. Check the floor underneath for any water or possible oil leaks and if they will let you test drive it (they do not usually), then do that. Do not be fooled into thinking that just because it may come with a full service history that the vehicle must be in good working order, as we said above, the previous driver may well have neglected maintenance and repairs. Use your common sense and ask questions and as long as you are careful about your approach to this process you should have no problem at all with buying a repossessed car in South Africa.